My school had our Open House last night and it has me so excited about the upcoming year! 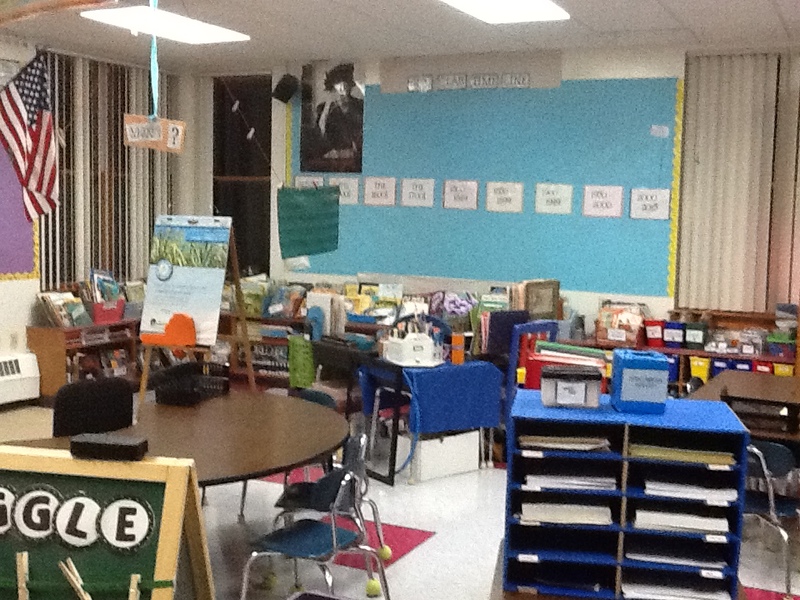 My new students were so excited to see our room and to have their parents meet me last night. Additionally, many of my former students popped back down to our room for a visit — it was bittersweet to see some of them. I can’t believe that they won’t be in my room anymore come Tuesday! I’m just about ready for the first day of school and my room is definitely the neatest that it will be all year. I’ve moved a lot of things around since last year and am pretty happy with how things are as I plan to start the year. (Maybe I won’t have to move everything around every month this year.) My classroom space has a lot of built-in things, which are nice, but they can also be pretty limiting in terms of options for arranging furniture. 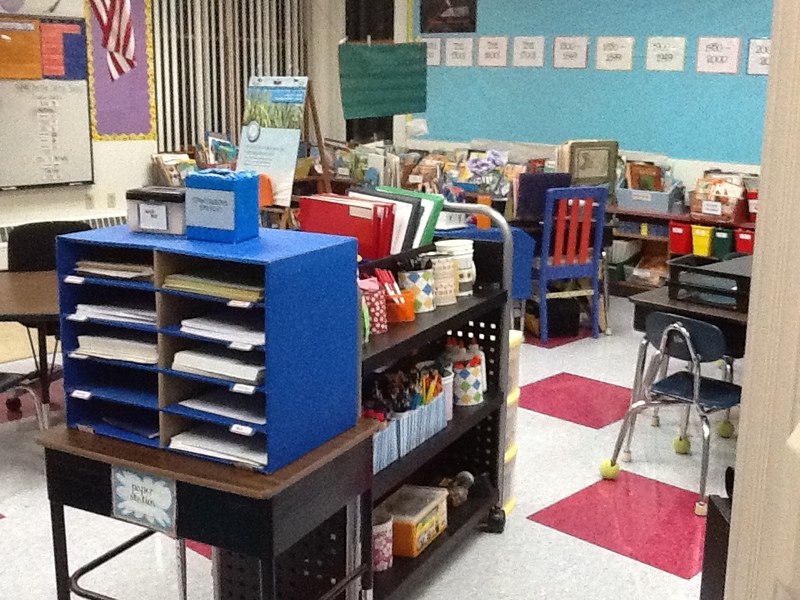 But, I think I’ve got things organized in such a way that the space will grow with our learning — there’s lots of room for displaying student work and storing their projects! So, without further, ado, here’s a tour of my space. 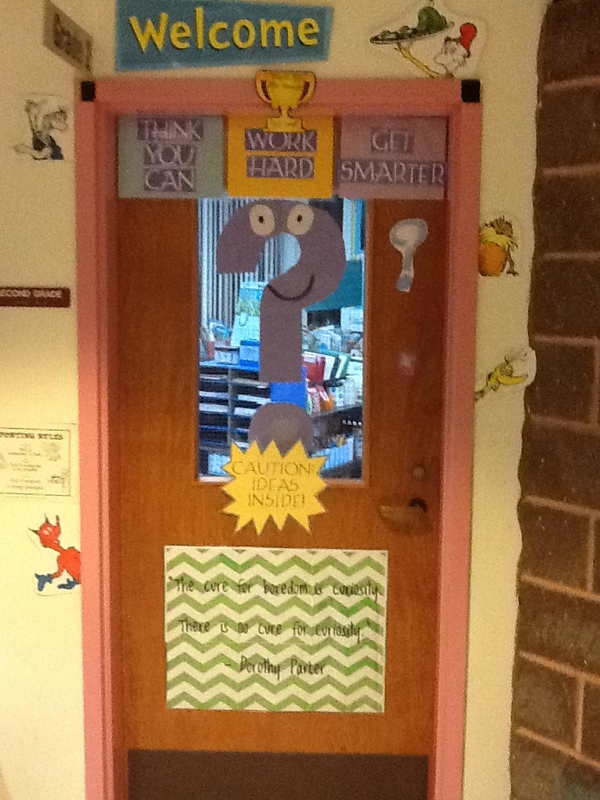 This is the door to my classroom – our class mascot “Q” remains prominently exhibited. 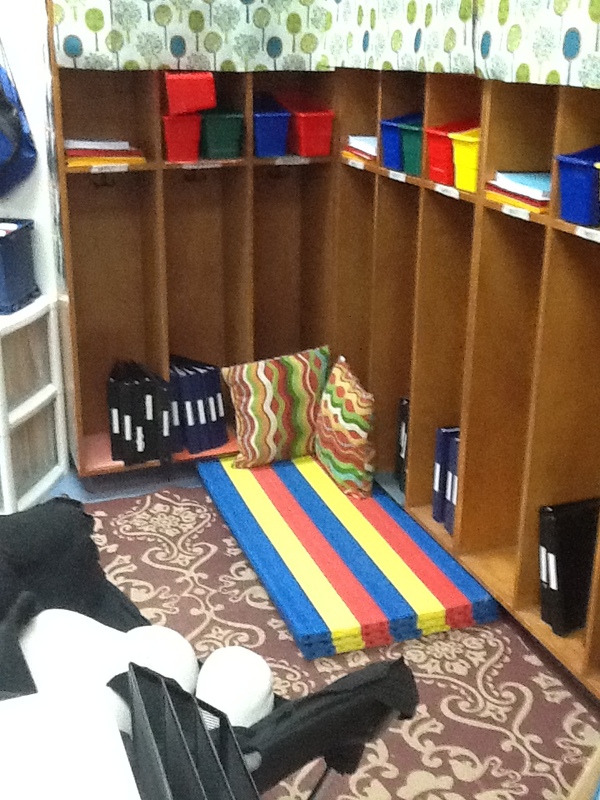 Our supply cart and paper station are just inside the door. Here’s the view of the room when you walk in the door. This is my desk (constructed from three student desks!) 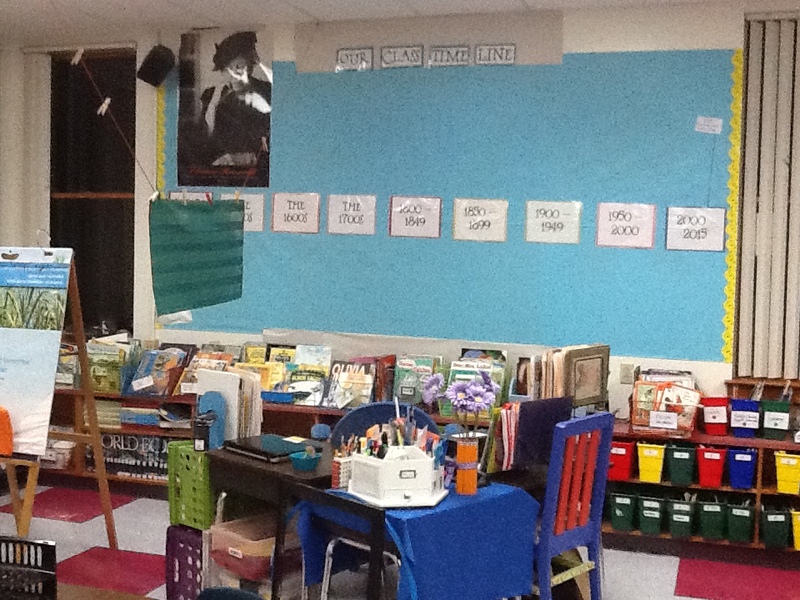 and our huge classroom timeline, which is one of things that I am most excited about heading into the year. 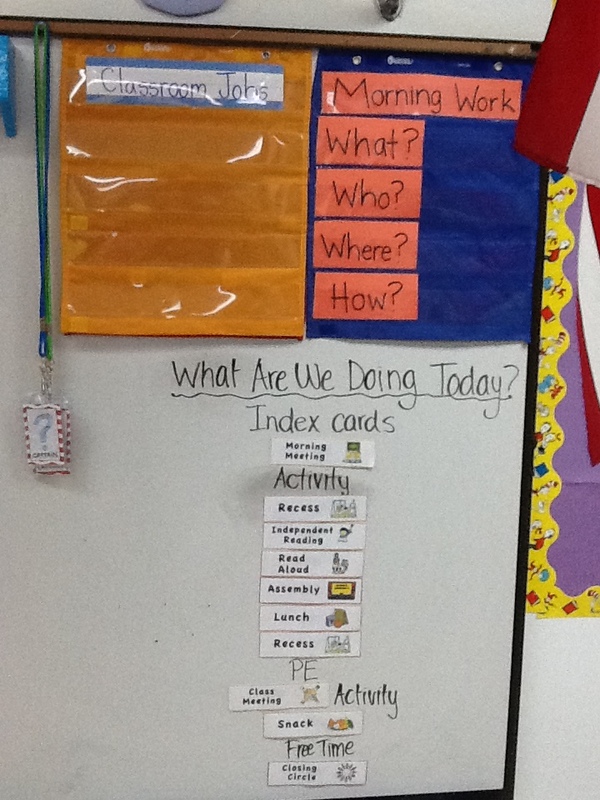 We’ll start by putting the birth dates of my students and their parents and grandparents and then we’ll add on key dates and events as we learn throughout the year. 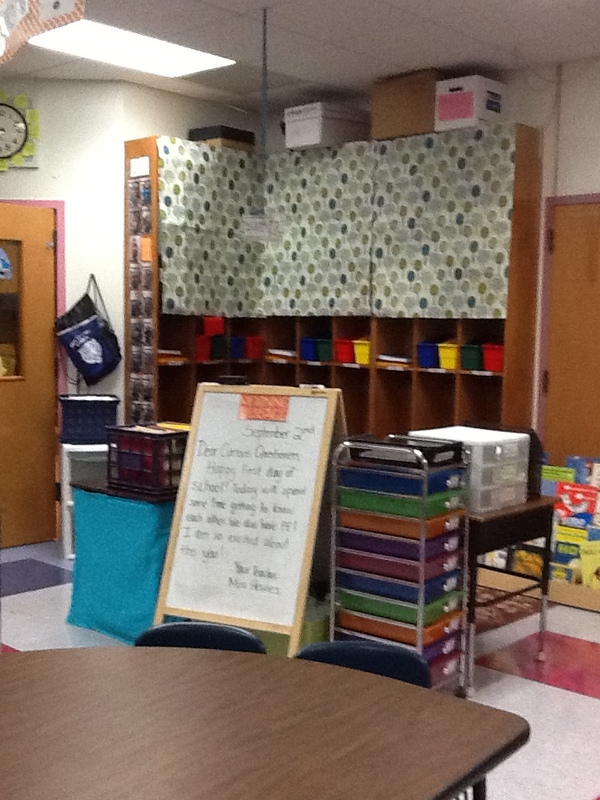 This is a view of our book nook, our center station, and our Morning Message Board. This is what the book nook looks like. 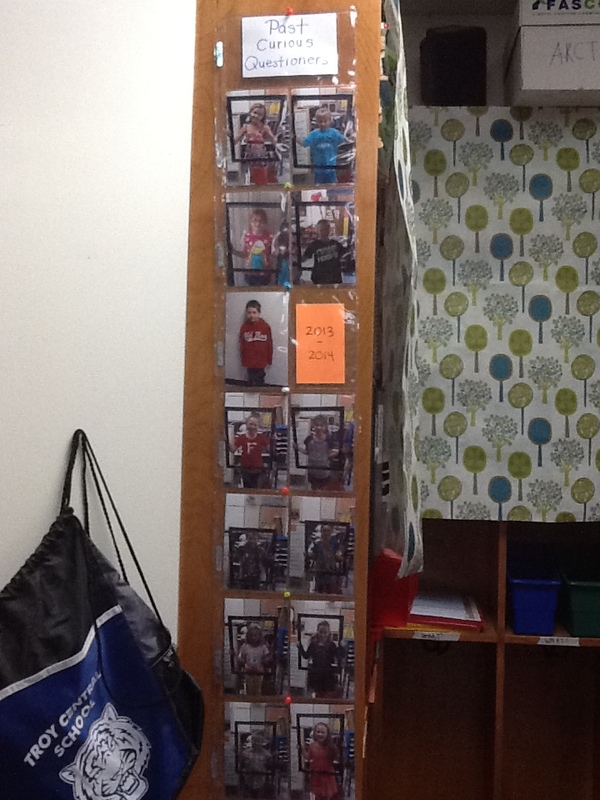 The cubbies are being used by each “team” of students to hold their academic materials. 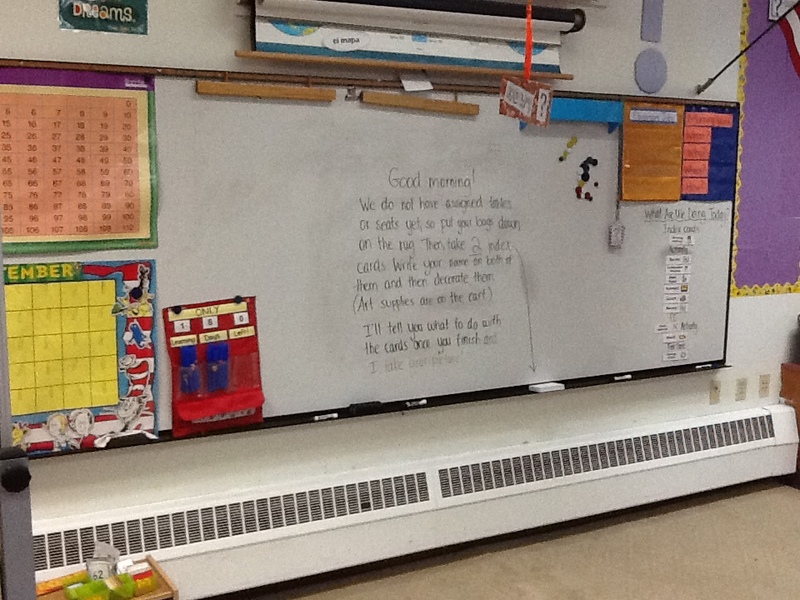 Here’s our Morning Meeting/game station, our “caught being kind” apple, and our book display. 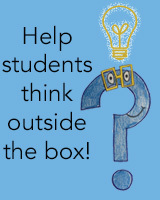 The start of school theme for the book display is books that reflect curiosity, questioners, and wonder — a perfect initiation for my new group of Curious Questioners! This is the “Where?” team table. 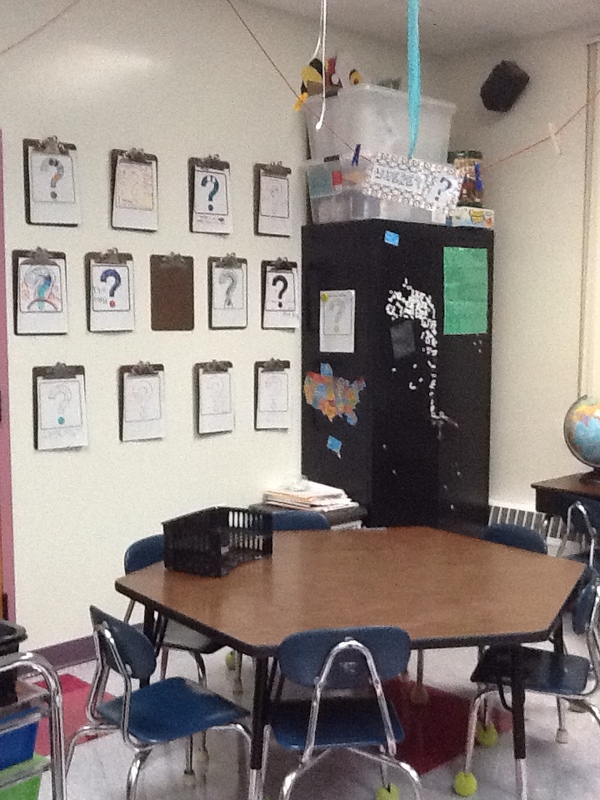 Behind it on the wall are the clipboards that I will be using to display work that my students choose as their favorite tasks and “best effort work.” Right now it has things they wonder about, an activity that we did together during step-up day last June. 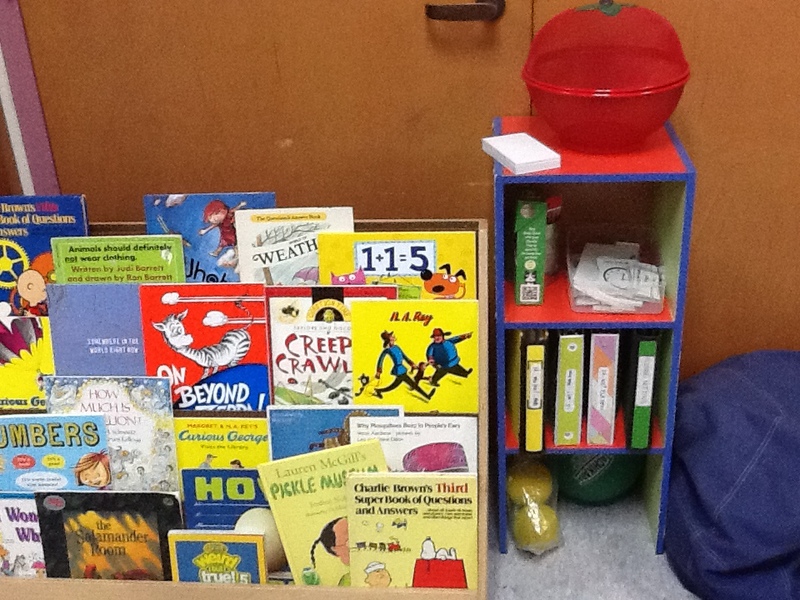 This is a work-in-progress, but it will be our “wonderment station,” a place where I exhibit things that are interesting in order to invoke my students’ curiosity. 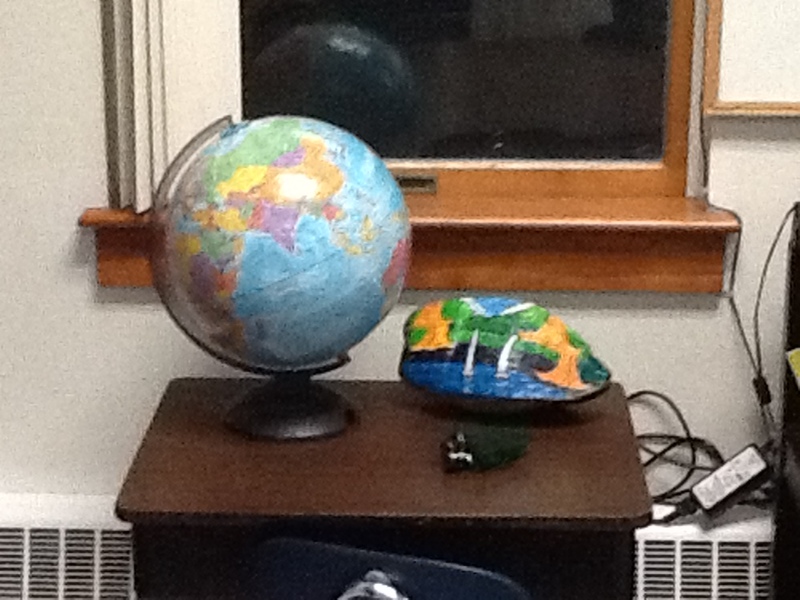 Right now, there is a globe, a coconut from Hawaii, and some magnetic rocks. At the front and center of the room is the white board and our rug area, where we gather for all sorts of learning activities. 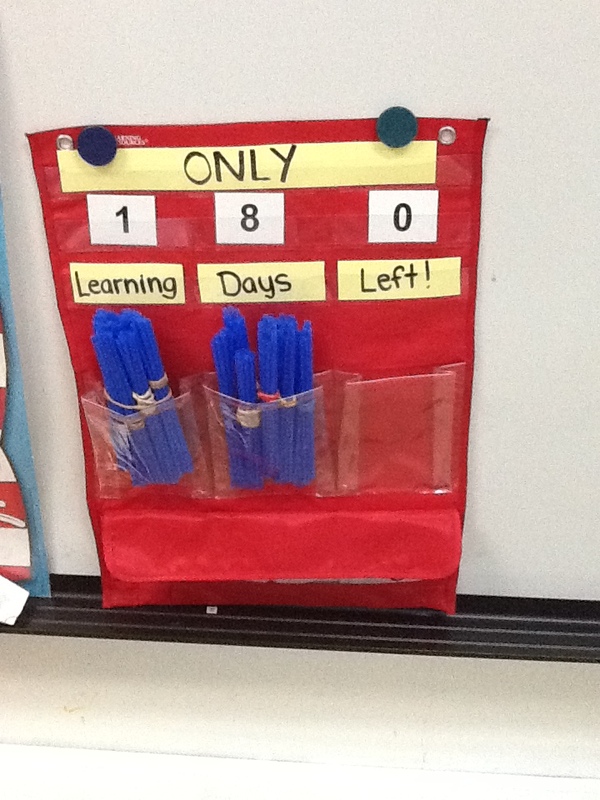 Instead of counting up the school days, I am going to have my students count down. 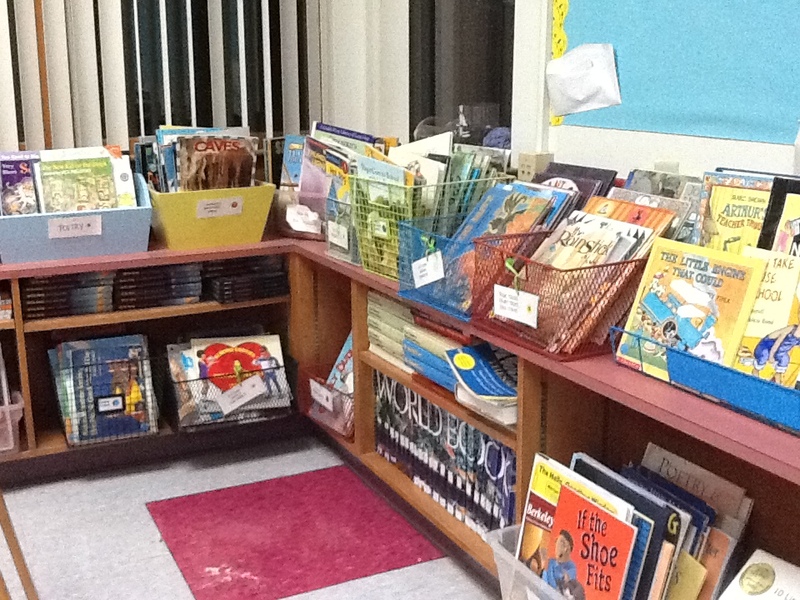 This is a close-up of just one part of our classroom library. 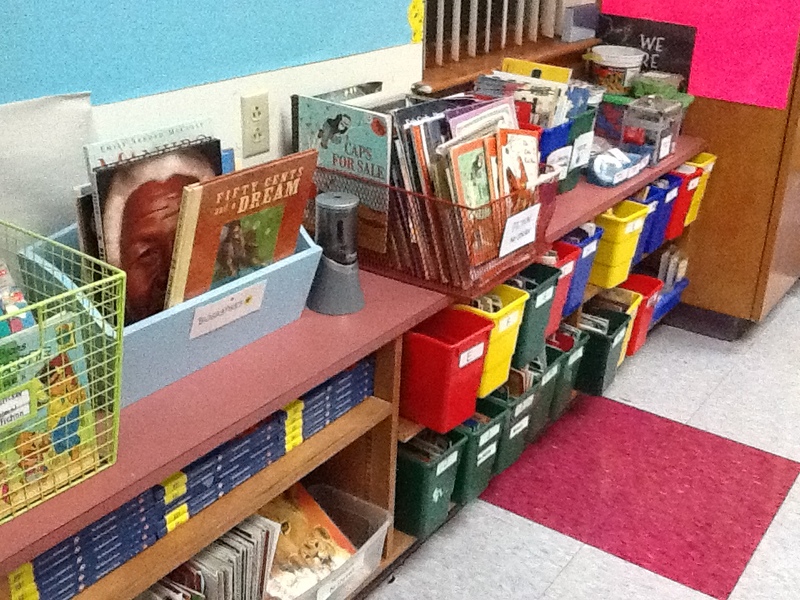 I have way too many books in my classroom (though I doubt that’s actually possible!) — so many of my bins are nearly overflowing now. 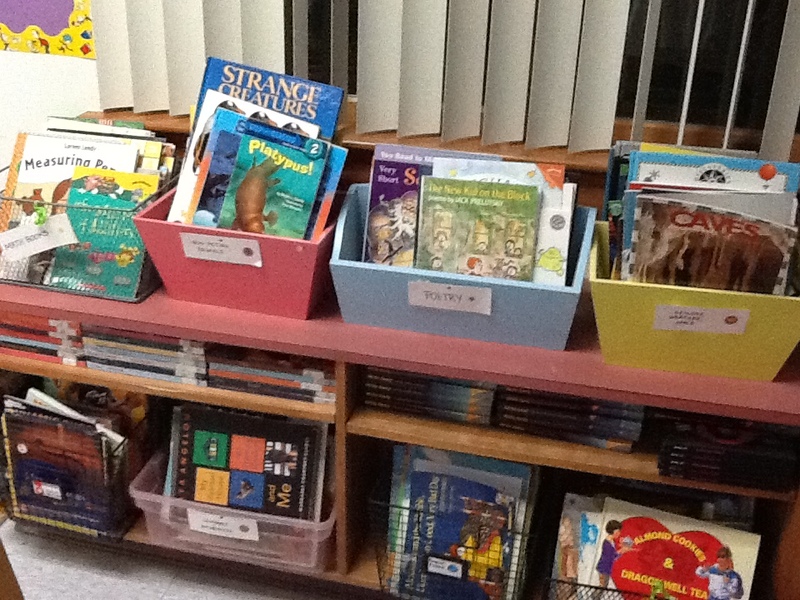 Two more shots of the classroom library — the bins have taken over all of the nice built-in shelving unit in my room! But, honestly, what’s more important than books? 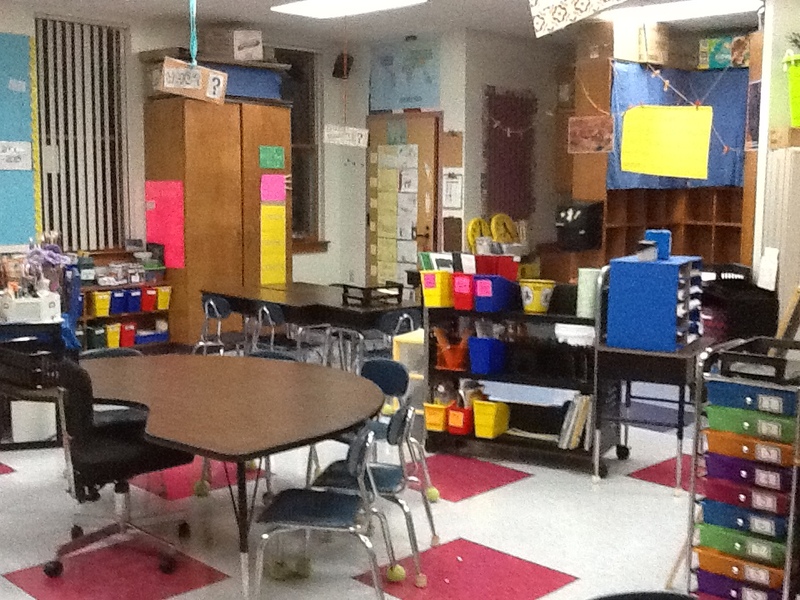 Here are some more-zoomed out pictures of the room. 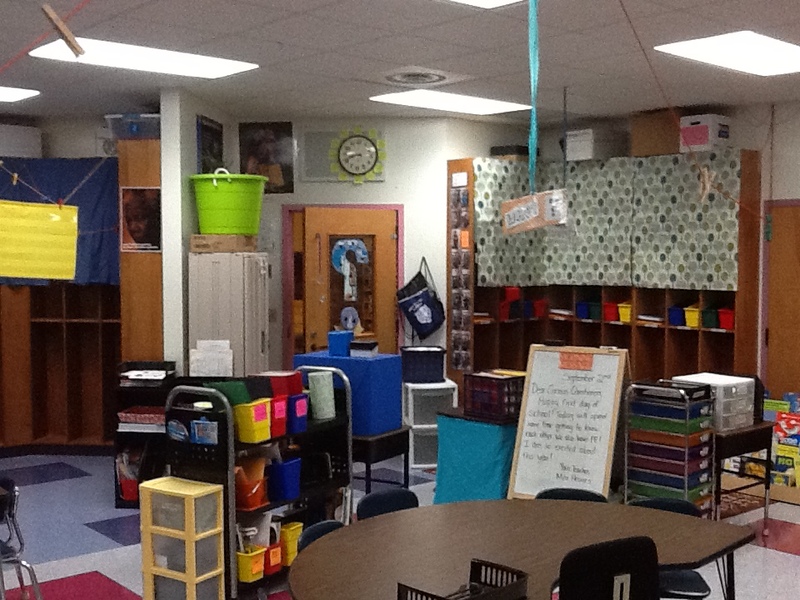 You can see the “What?” and “Who?” student work areas and get a sense of how the classroom is laid out. And one of my favorite parts of the room — the “Past Curious Questioners” gallery that shows all of my former students! 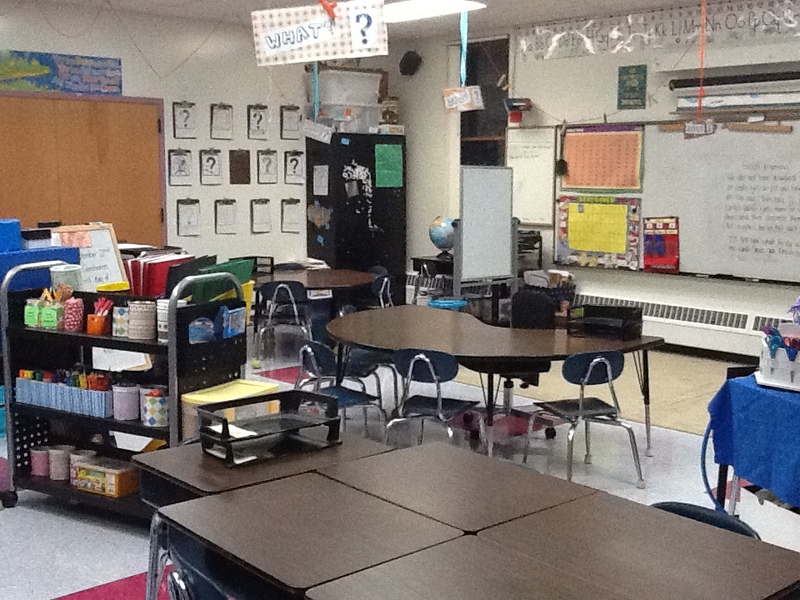 School starts on Tuesday — I can’t wait to start filling this space with my students’ creative thinking!